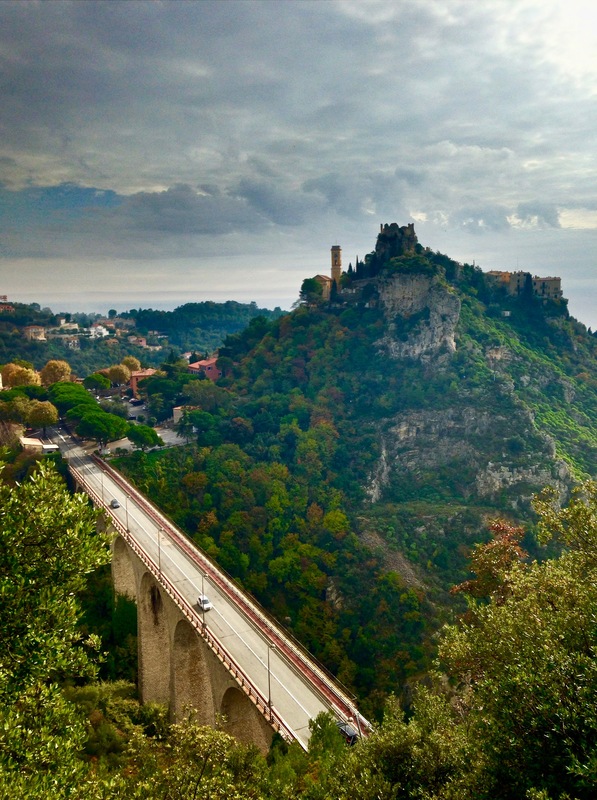 I have been trying to visit Roquebrune, (a hillside village above Cap Martin and overlooking Monaco) for some time, but every time we had gone the traffic, parking and crowds had been overwhelming so we chose to pass and try again another time. Well, it is November and there are usually not as many tourists around at this time of year, and as it was a beautiful day, I decided to give it another shot. I rented a scooter for the day and headed east along the Moyenne Corniche, past Eze, and finally reaching Roquebrune. It is a picturesque medieval village with narrow streets and walkways, vaulted passages and everything built out of rock. There are lovely little squares and fountains here and there, wrought-iron balconies and other charming discoveries. It hasn’t been overdone like Eze, it is still a live-in older village, although a “newer” Roquebrune that is car accessible has built up around it. I basically had the place to myself as there were very few tourists, just a few locals returning home with groceries and such. A couple of restaurants were open, but most had closed for the season. After Roquebrune I followed the road out of Roquebrune east, into the hills and came upon another hillside medieval village tucked away in a valley, called Gorbi. Gorbi is a little out of the way so it isn’t as well visited as Roquebrune, although much of the town is under construction so it looks like they have hopes that it will become so in the future. From Gorbi I made my way back down to the coast to Mention, stopped in Cap Martin for lunch, and then slowly made my way back to Nice. The Conseil General Alpes Maritimes publish a number of booklets (available online as well) that describe many of the walks and hikes that can be discovered enjoyed along the Cotes d’Azur. We’ve been enjoy many over the past few years, and below are some of our favorites. There are 60 in total in three books; Pays Cotier, Moyen Pays, Haut Pays. If I’ve written previously about it, a link is included. “A” means they are from the first book (closest to the coastline walks) and the number signifies the number of the hike in their book. They are rated as Easy, Medium, Difficult and Sportive. As we accomplish more we’ll continue to add to this list. This medium-rated hike is rated easy and take only a couple of hours to do the circuit. 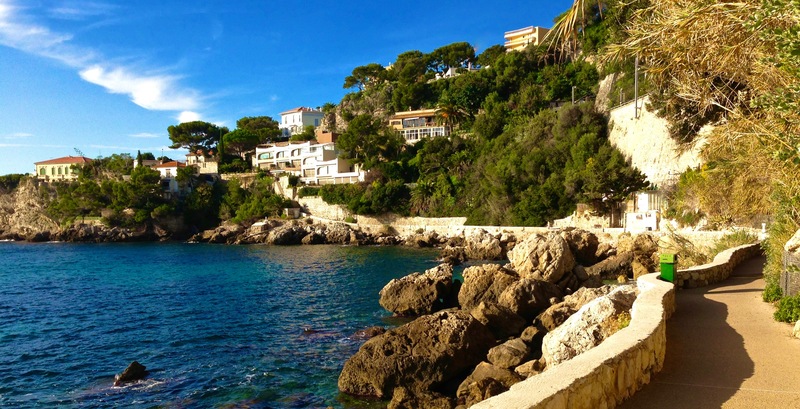 It is situated near Roquebrune, but can be difficult to find, you may want to use a GPS to get to it. The views at the end are so incredible that you should pack a picnic so you can sit and enjoy the panorama. To the east you look back towards Menton and Italy, while to the west lies Monaco. Part is by gravel road and part is a well-kept path with rock steps in many parts of it. Here’s a map of the hike, a description (in French) and where it is located. This is an easy walk that you can get to by taking the #82 bus in Nice right to its final destination. The entrance to the walk is near the L’Hermitage hotel nearby. Takes a couple of hours to do and it does provide some nice viewpoints at certain spots along the trail. Great hike with lots of viewpoints along the first half. A lot of stairs and verticalness for the first part, but well worth it for the views. Easy descent into Eze-sur-Mer and for a swim and lunch. These two should be lumped together as the both involve coming and going from Eze, which is easy to get to taking the #82 bus), #15 takes you above it, above the Grand Corniche, while #19 takes you up to Nice from the coast, over the bridge and up Mont Bastide and then back down to the coast. 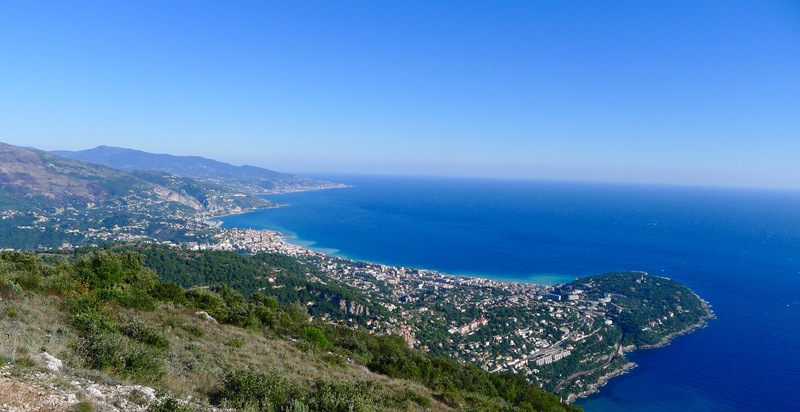 #15 is a medium-rated hike that climbs up from Eze to the Grande Corniche and past to the Fort of La Revere. It does a loop and takes you back down to Eze via a different trail or small road. On the return, if you still want more, you can continue down from Eze to Eze Sur-le-Mer. This bit of a challenging hike takes you to the top of the large rock that sits behind and above Monaco and Cap d’Ail. Amazing panoramic views, like the shot above. 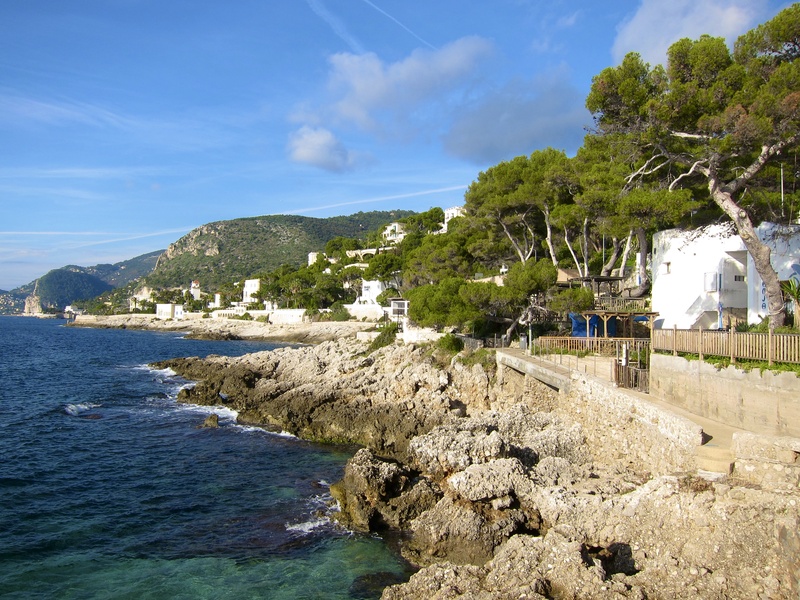 Circular route that is easy to get to starting in Cap d’Ail. Weather was clouded in so couldn’t get a great photo. The circuit du Mont Bastide is labelled “sportif” and it certainly a challenge on the bottom part of it. We walked down from Eze Sur-le-Mer to Eze Village, and realized going up would really be tough. But it could be done a number of different ways. Eze up to Fort de la Reserve (#15) and back down to Eze. Medium-rated hike, a bit steep, easy walk back down. About a 1.5 hour hike. Eze up to Mont Bastide (#19). Nice medium-rated hike, can picnic up at the top with exceptional views and nice places to sit down (though not much shade). Takes about 45 minutes to the top. If you want the views and the picnic and an easy route it is also possible to reach from the Grand Corniche, just past the Hotel l’Hermitage, on the right. You can take the #82 bus to its final destination which will drop you off at the end of its line, right by the upper entrance to this hike. Eze to the coast is a tough hike up but not bad going down. Join it in with #1. The trail down on #19 is not that great, or just go down to the Moyenne Corniche and walk back across the bridge to Eze. More information available here, here and here. A very easy walk along the coast from Menton, around Cap Martin, to Monaco. Takes a couple of hours and at the end you can catch the train back to Nice. This is one of our favorites, as it provides a wonderful way to walk into Monaco. And it easy to reach by bus or train. Full details are here. This a great walk that can be done a few different ways, depending on how long you want to walk. Full details are available here. Long tour, starts either at St. Jean Village or at Plage de Passable on the other side of the peninsula. Short tour, Point Saint-Hospice that walks around the smaller peninsula. Longer tour; join the two above together. Longer yet tour, start or end in Bealieu and walk along the coast to Saint Jean and then take one of the walks described above. 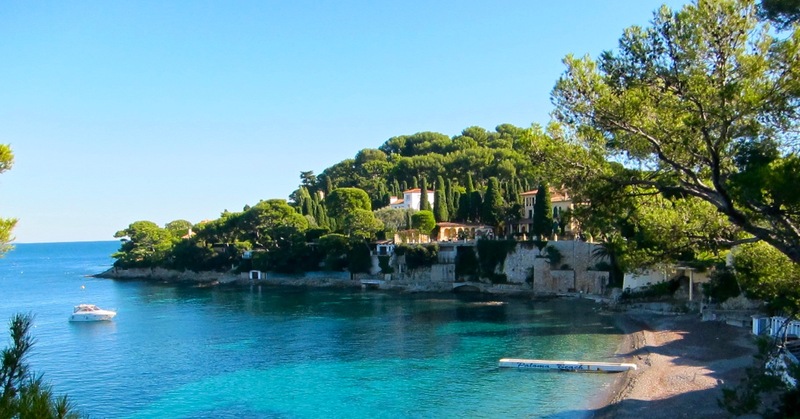 We prefer the first part of this walk, shown on a map on this page, where you walk from Beaulieu to Saint-Jean along the coast, and then take one of the two Cap Ferrat walks. A lovely extension to two first-class coastal hikes. St. Jean is a great place to finished off for lunch, or at Paloma Plage (above) where you can also swim. This is the shorter walk that goes around the smaller peninsula (Hospice) of Cap Ferrat with full details here.